The interesting part for me here is the detail post-processing pulled out from the original, shown below. In the original most of the moon as blown out. I shot in RAW (or more precisely Nikon’s version of RAW, NEF.) With the Recover, Highlights and especially the Levels tool really pulled out the information present in the RAW file. This is handheld at 6400 ISO, and cropped to less than half the original size. The camera was a Nikon D90, the lens was the Nikkor 70-300mm AF-S ED VR. 1/200 sec, f/f.6, lens at 300mm. Exposure was at -1.3 stops to keep the moon from overexposing. 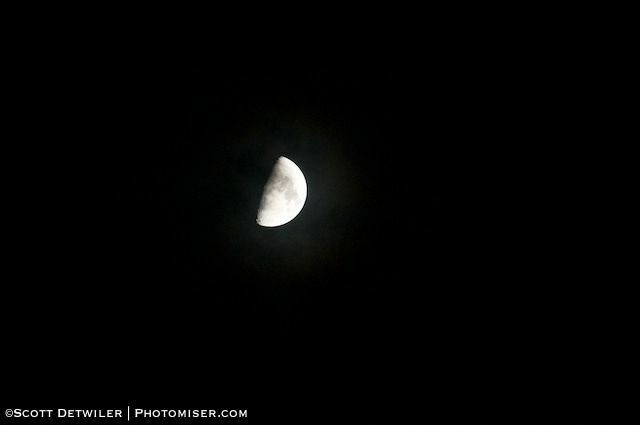 There were wispy clouds over and around the moon, though post-processing cleared those out.